Increasingly as the 19th century progressed, aristocrats and bourgeois alike discovered the pleasures of holidays by the sea. 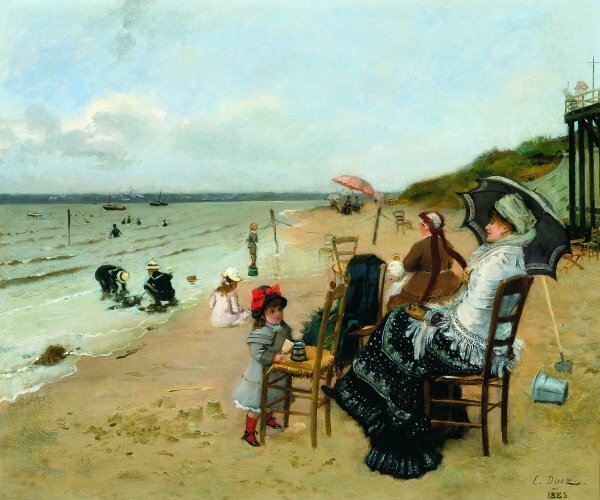 Sea-bathing was held to have health-giving qualities; but even sitting in groups on the beach, clothed and of course with parasols, became the norm, as can be seen in the many paintings by Boudin, especially those of Trouville in the 1860s. Many artists portrayed this new subject-matter. Monet also painted holiday-makers on the beach at Trouville in 1870 (London, National Gallery). Manet showed his brother and his wife on the beach at Berck in 1873 (Paris, Musée d'Orsay). While Degas depicted bathers, holiday-makers and ships on the horizon as a young girl has her hair brushed by her maid on the beach (London, National Gallery). These were modernist painters, generally lumped together as Impressionists. But more conservative artists also discovered the beach and its pleasures. Among these juste milieu artists was Ernst-Ange Duez. On this medium-sized canvas, Duez gives us a slice of a Channel beach: Northern certainly, slightly overcast, but with parasols playing a symbolic game. Other symbols of leisure on the beach are included: buckets and spades, sandcastles, some gentle sea-fishing by children, simple, Spartan chairs (some abandoned); and beyond a dividing fence, sea-bathers. The centre of attention is the woman seated in the foreground watching her child with a protective glance: is she perhaps a widow?. Oddly no adult males can be seen. This rather sad image, painted in 1885, seems at the opposite pole to the Impressionists. Brushstrokes are tightly controlled; colours are subdued, essentially producing a tonal harmony of greys, browns and blacks (only the little girl breaks the harmony by wearing red stockings and even more strikingly a red bow in her hat). Blacks -and browns- were banished from the palette of most of the Impressionist painters (Manet and Renoir apart). And Duez's figures are highly finished, quite distinct from the surrounding sand, sea and sky. Duez, indeed, would appear justifiably to be a juste milieu artist, perhaps more academic and more Salon-inclined than naturalist or impressionist. 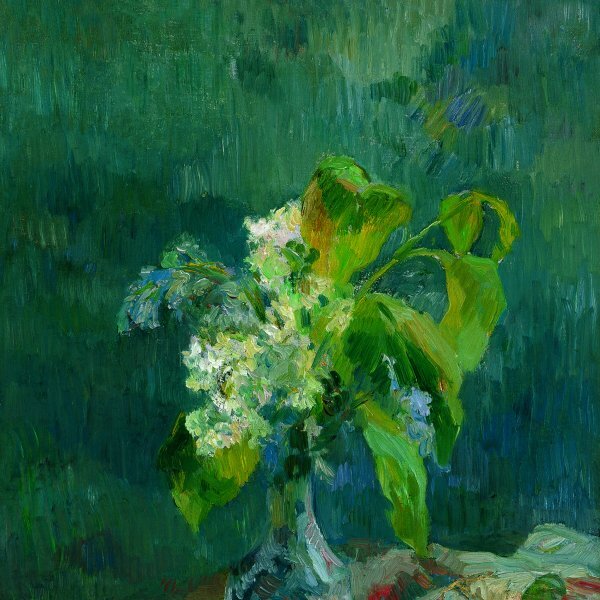 Yet Duez was an artist who knew and admired Edouard Manet; who owned paintings by Claude Monet (one of which he actually lent to the fourth Impressionist exhibition of 1879) and Berthe Morisot, as well as one of Degas's fans. Duez was not an Impressionist in his own painting. But he was liberal enough to acknowledge the significant breakthrough made by the Impressionist artists in the 1870s. That adds another dimension to this modest-sized painting. Duez may be closer to the Belgian artist Alfred Stevens and to the Italian De Nittis, yet again, each of these artists owned works by Monet and Degas. All this acts as a warning for historians not to imagine that artists divided off into rigid self-contained groups, forbidding entry to any interloper with different stylistic beliefs and practices.